I was really excited when CoOptions contacted me about creating an original sponsored recipe* using products featured on their healthy coupon site, EverydayHealthyValues.com. One of the things I hear a lot from people who’d like to eat healthier is that they’re worried it will be more expensive. What I discovered when I visited Everyday Healthy Values (which was formed in partnership with global health services company, Cigna, and is powered by coupons.com) is that they have coupons for a lot of the popular brands and products I already buy. I personally printed out grocery coupons from Smuckers, Yoplait, Weight Watchers, General Mills, Boca, Uncle Ben’s, Nasoya, and more. In addition to food coupons, they also feature brands like Pampers, Aleve, Advil, and One-A-Day Vitamins. They appear to change out the coupons and brands fairly frequently, so it’s a good site to bookmark and check daily so you don’t miss out on any great deals. Who wouldn’t want to spend less on groceries? 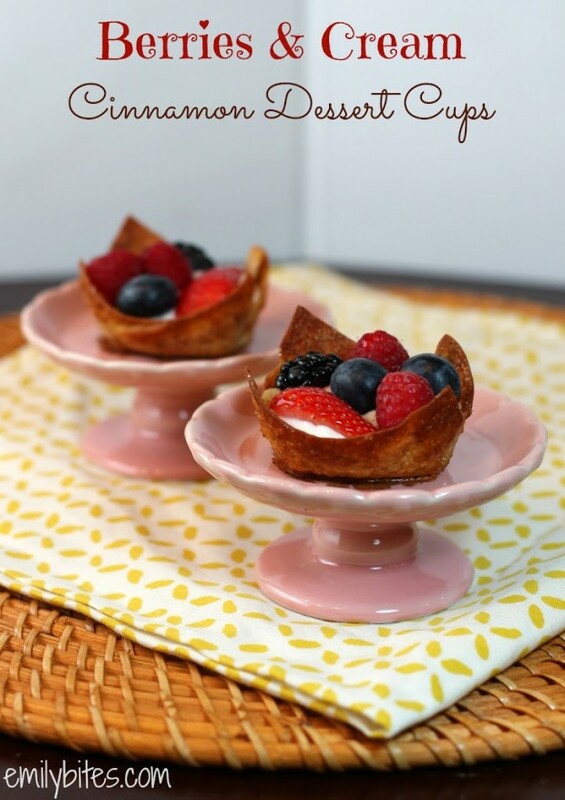 For this Berries & Cream Cinnamon Dessert Cups recipe, I was pumped to see a coupon for Nasoya products. They happen to already be my favorite brand of wonton wrappers (and y’all know I love wonton wrappers). I also used a Yoplait coupon to try out their new Greek yogurts, which I really liked and will buy again. I’ve been meaning to make a dessert recipe using wonton wrappers for a long time now and I can’t believe it took me this long. These cinnamon wonton cups are crazy good. They’re super thin and crispy and pack a ton of cinnamon sugar flavor. I actually can’t stop thinking about all the different things I want to put in these cups (homemade apple pie filling, cannoli filling from my Chocolate Chip Cannoli Cups…the possibilities are endless). Before you try any of those though, I really recommend you try the sweet cream cheese and yogurt filling and fresh berries combination I listed below. These cups are equal parts crispy, creamy, sweet, fresh, juicy and an all-around crowd pleaser. 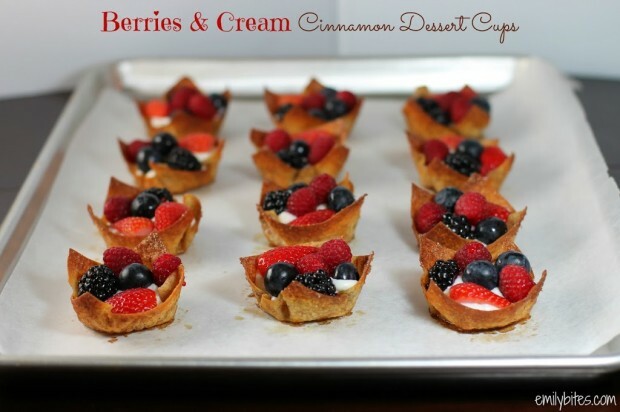 This is truly a dessert your waistline and your wallet can feel good about! *I have partnered with Cigna and CoOptions for this post to help promote their healthy coupon site, EverydayHealthyValues.com. I have been compensated for my time, however my opinions are entirely my own. Pre-heat the oven to 350. Lightly mist a muffin tin with cooking spray and set aside. In a small dish, mix together the 5 teaspoons of sugar and one teaspoon of cinnamon. On a sheet of parchment paper or a clean surface, lay out the wonton wrappers. Lightly mist the wrappers with cooking spray and then sprinkle each with ¼ teaspoon of the cinnamon sugar mixture. Flip each wrapper over and mist these sides with cooking spray as well. Sprinkle each with another ¼ teaspoon of cinnamon sugar mixture so that both sides are coated. Push each wonton wrapper into a slot of the muffin tray to form a cup. Bake in the oven for 8 minutes until brown and crispy. Set aside to cool. In a medium sized mixing bowl, combine the cream cheese, yogurt, vanilla extract, and the remaining 4 tablespoons of sugar. Using and electric mixer (hand or stand) mix until smooth. Divide the yogurt mixture into each of the cooled cinnamon cups* (each one will receive a generous tablespoon of filling). 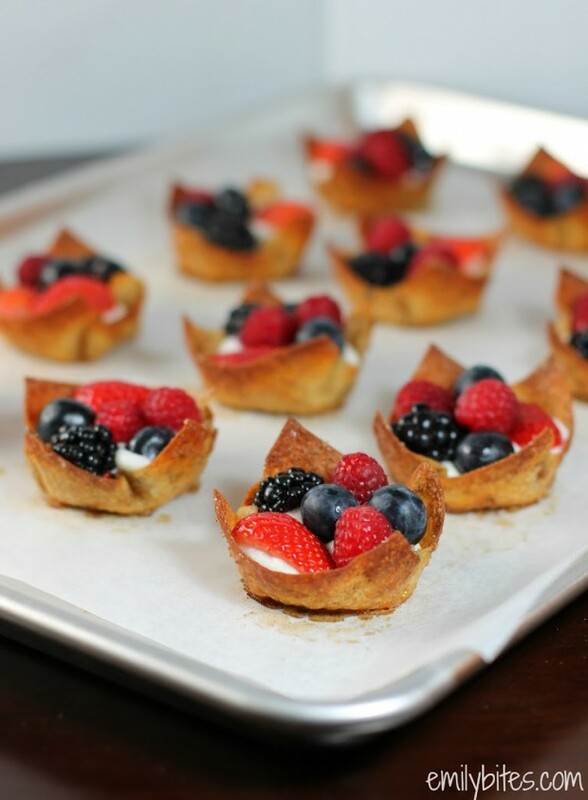 Top with berries and serve. If you don’t plan to serve these all at once then I recommend storing the cinnamon cups and filling separately and filling them as needed so that the cups remain crispy. sounds yummy! I’ve made dessert cups with the wonton wrappers. I mix chopped apples with a couple wedges of the cinnamon laughing cow, then bake. Tastes like apple pie. Wow, looks like a delicious dessert. I want to try this. Thanks for the recipe. Emily these were inspiring and worthy of a spring brunch or party. I made a few quick modifications since I did not have cream cheese. I used the vanilla greek yogurt and add 2 tsp of orange zest omitted the extra sugar and vanilla. They were delicious and so diet friendly! Keep those great recipes coming. I will be trying your taco cups next! Thank you!! Select a theme which requests to you. Choosing a theme frequently takes as much study as the dissertation itself. Once you choose a theme it is imperative that you perform wide research. These are divine! I made them for a WW meeting and everybody loved them! Made these for mother’s day and they were a hit! My daughter has just found the blog as she is starting to into cooking, and she said the magic words “can we make them ” Result. so we will. These were so good! My friend made them last week and we loved them 🙂 Thanks! These are so divine, we made them yesterday my daughter really enjoyed it. I think a translator should (ideally) not have to bother with part files at all, especially in environments where the product to be translated might actually change several times a week or even per day (modern mobile apps for example). Versioning can become tricky at that point… english to italian translato. Just an FYI, if you use Splenda instead of sugar and plain fat free Greek with an extra 1/2 tsp vanilla, you cut it down to 1 PP per cup. Can I use regular non fat yogurth instead of the greek yogurth? In my town it’s hard to find.